CORK FOOTBALL MANAGER Ronan McCarthy has made two personnel change to his Rebels side to face Tipperary this weekend. Castlehaven’s Mark Collins starts in the half-forward line with Éire Óg star Ronan O’Toole dropping to the bench, while Brian Hurley starts at full-forward and Paul Walsh misses out. There are positional changes all over to the team that started against Meath last time out. Mallow’s Mattie Taylor drops from the half-forward line into defence to take Walsh’s place, as Ruairi Deane slots into wing forward, allowing Hurley to take the number 14 jersey this weekend. The Royals came out on top by six points at Páirc Uí Rinn last Saturday and with Division 3 football looming ever closer for Cork at this rate, they’ll be hoping to get their campaign back on track in Thurles on Saturday evening [throw-in 7pm]. This Round 5 fixture comes for the Leesiders after an opening day draw with Fermanagh, and defeats to Kildare, Clare and Meath. 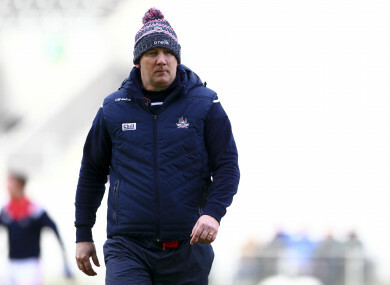 Email “Couple of switch-ups as McCarthy names Cork side for Tipperary clash”. Feedback on “Couple of switch-ups as McCarthy names Cork side for Tipperary clash”.